New, completely rewritten version, with a couple of new features, but also with breaking changes. Because of that I saved it as another script - if you want to use it then disable the previous version and install new one, if not, then you can use old one as long as it will work. You will need to set again all settings (in popup) if you install new version. There will be no more changes in syntax for those features in the future, unless they stop working by changes in Dynalist itself. This is mighty! You’ve put so much work into this. The focus mode is super elegant. And the text highlighting is very welcome. Amazing. As with the previous script, I find this one doesn’t always save the settings. I have to re-activate some of the options each time I open Dynalist. Is there a way of saving them more permanently? Also, ESCAPE no longer clears the search bar. You have to do this manually, which is a pain. Is there a way around this? My dream is that one day there’s also a panel in Omnifocus which is a list of the calendar items in agenda mode. You’ve awakened such great possibilities. Awesome work, well done Piotr!! I didn’t noticed any problems with that, which options you need to re-activate? These options seems to be active/changed in settings but are not working, or you can’t set them permanently and each time you see default settings? My dream is that one day there’s also a panel in Omnifocus which is a list of the calendar items in agenda mode. Great to hear about agenda. Strangely, the Escape key is working now and clears the search bar. However, I do note that in Focus mode the search bar appears only for one second before disappearing and the cursor returns to the item. Has anyone got the powerpack working with tampermonkey + dolphin browser on android?? Also also: I don’t know if you intended it this way but I love that all your functions are tags so we can use them through the drop down menu … very clever! LOVE focus mode - amazing for giving presentations!! In future maybe a tag so that a tagged section never loses focus? Good idea. How to name that tag? #focus, #visible, … ? maybe simple #f ? 1 - Even when I don’t have Omnipanel active, all but four (random as far as I can tell) bookmarks are not visible in the bookmark pane. 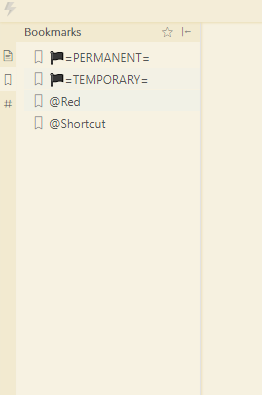 2 - When item styling is turned on, after a short time I am unable to go anywhere else in dynalist - I can’t zoom in to bullets, I can’t press the breadcrumb trail and I can’t go to any of my bookmarks. I have done some testing and I’m pretty sure this is limited to the item styling option (I have to refresh to fix this). also the onfocus is awesome really like not having to see my bookmark panel +1 thanks for the omnipanel support with file+bookmarks preview all together. Omni Panel is not doing anything with bookmarks, it’s only to show/hide/reposition existing panes. “Attach bookmarks as filters to corresponding documents” is now separate option and is working with and without omni panel, maybe it’s turned on? Other than that only “Icons as links in files and bookmarks” is doing anything with bookmarks. You can try to deactivate some features to check which one is doing this. Piotr on the embed iframe snippets wouldn’t it make sense , that when its disabled you can click URL?